Are you a Junior this year? I am looking for fun, bold, outgoing students who are active and involved in their schools and communities to represent Sassyfrass Studios. It's like a really fun part-time job where the only requirement is being AWESOME! !...oh yea and referring me to your friends and family. Seeking reps for all Southern Oregon High Schools: South Medford High School, North Medford High School, Crater High School, Eagle Point High School, Ashland High School, Phoenix High School, Rogue River High School, St. Mary's High School, and Grants Pass High School. Only a limited number of reps per school will be accepted, so apply now! - A FREE basic photo session tailored to you! The session will last between 1 to 2 hours. 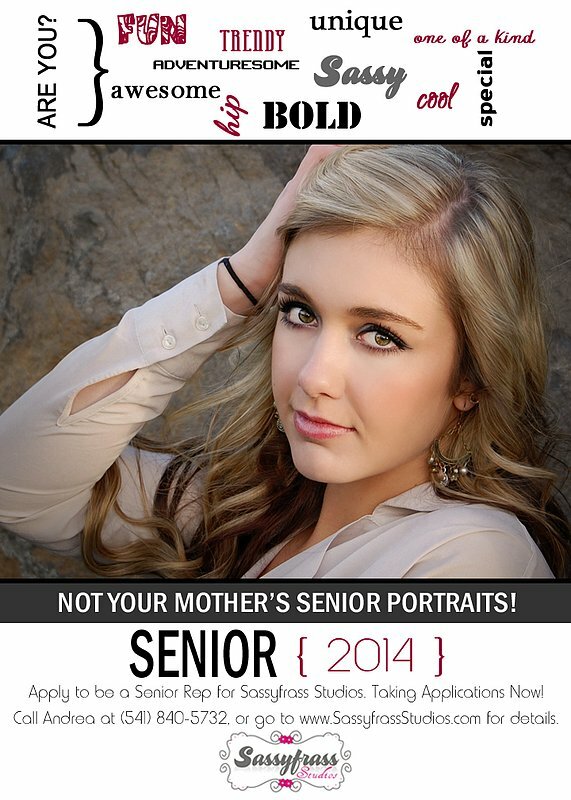 - Rep Cards with photos from your session to pass out to family and friends. - 5 to 10 watermarked images, and a custom "cover" image to share with friends via Facebook. - 25% off any print purchases from your session. - Opportunity to earn additional discounts on prints and products. The more referrals you provide, the more stuff you get! Send an email to Andrea at: SassyfrassStudios@gmail.com with your Name, Age, Phone #, City, School, and a few words to explain why you think you would be a good rep candidate. Please label the Subject line of your email "SENIOR REP". I will be accepting 1-2 reps per school - both girls and boys.